Beautiful detached 3 bedroom villa with private pool and garden in Vilamoura, near to Pinhal Golf Course. Newly refurbished. Child friendly. Close to Marina and all amenities. 5 golf courses nearby. Villa Gales is a stylishly refurbished 3 bedroom villa with private pool, private lawn area and roof terrace. It has a brand new kitchen and bathrooms. It comprises a spacious lounge area with large flat screen television with cable TV (good selection of English channels) and a DVD player; a bright dining area with seating for 6; a well equipped kitchen with microwave, washing machine, dishwasher, iron and ironing board; a master bedroom with king size bed and en suite with shower; second bedroom with king size bed; third twin bedroom and a family bathroom with bath and shower. All bedrooms have fitted wardrobes. Two excellent camp beds are available for families with extra children. Free Wi Fi throughout. Air con in lounge, master bedroom and twin room. Fan in double room. There is a travel cot and high chair provided free of charge. The outside area has a terrace area with swimming pool, sun loungers, BBQ and dining table for 6. A separate garden area to the sides and rear of the property is fenced off from the pool area so children can play safely. A patio area with a second table and seating can be found here. There are steps to the to roof terrace (which are not gated off) which is a nice size and perfect for a drink in the evening sun. 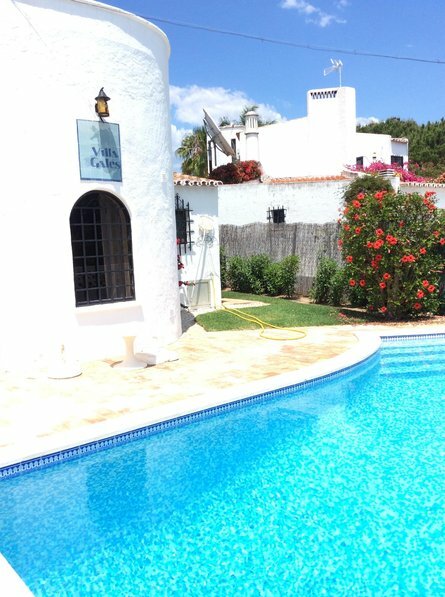 The villa is located approximately 25 minutes from faro airport. It is less than a 20 minute walk to the marina with its large selection of bars and restaurants. The beach is also a 20 minute walk. The villa is located a 5 minute walk to the Hilton Hotel where the tourist train makes regular journeys to the marina and the old village. There are 2 bars within a 10 minute walk. There is a large supermarket at the marina but also a smaller one within a 5 minute walk for essentials. A beautiful and relaxing place to spend your holiday in the Algarve.